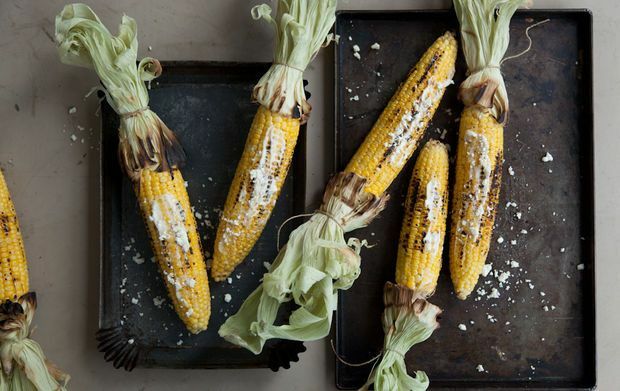 Today, Pati takes Elote, the famous Mexican street food, and brings it straight to your kitchen. Messy goodness on a stick. That’s what this is. Crunchy, juicy, sweet corn slathered in butter and mayo, coated in crumbled queso fresco, sprinkled with chile powder and salt, and drizzled with lime juice: it is one of those ubiquitous street foods of Mexico. I stalk street corn vendors when I am in Mexico, and my kids do exactly the same thing. To keep us all out of jail, I give them a hit of the "crazy corn" at home. Though my boys tend to have radically different preferences, this is one where their preferences clearly align: they want everything on there. When you serve it, just lay out all the garnishes -- and lots of napkins -- and let them go. Pati, a very sincere thank you for the Wildcard pick! I was planning crab cakes for the Independence Day holiday and I think this might be a perfect side to accompany the dish. I hope to make it to one of your classes someday! Thank You! A combination of dijon mustard, smoked hot paprika, lime juice and salt is what I usually do. I eat this all the time. I brush my corn (which I usually bake inside my oven, maybe at 450 degrees and the last minutes on "Hi Broil")with mayo, and then roll it into the cheese (crumbled on a plate), and I then sprinkle it with cilantro and some lime juice. No need for salt since the cheese is salty enough. I love love love this dish! I eat this all the time. I brush my corn (which I usually bake inside oven) with mayo, and then I roll it on a plate loaded with crumbled queso fresco, and then I sprinkle some cilantro and lime juice. No need for salt since the cheese is salty enough. I LOVE LOVE LOVE IT!